Fragrant, leafy, rhizomatous, semi-tropical perennial herb up to 2 m tall, with magnificent display of large, conspicuous yellow flowers in late summer, followed by scarlet seeds in capsules. Major problem of conservation areas in Auckland and further north. Flowers Pale lemon-yellow with conspicuous red stamens, fragrant, in large open inflorescence 25-45 cm long. The narrow bracts do not overlap, and each envelopes two flowers. The corolla tube is about 5 cm long, with a two-lobed labellum. Flowers Feb-Mar. Fruit Three-valved capsule, 15-18 mm long, orange on the inside, containing numerous bright scarlet, shining seeds, each 6 x 4 mm. Leaves Lance-shaped, 20-45 cm long by 10-15 cm wide, short-stalked, tapering to a point. 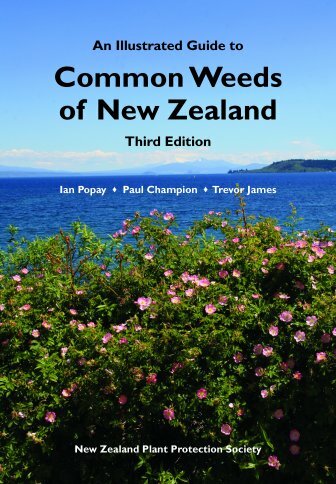 Common in North Auckland, very common in and around Auckland City, common in Coromandel Peninsula, Kawhia, Bay of Plenty, Opotiki, and Gisborne City, and in Nelson-Buller area in SI. Originally from South Africa. Yellow ginger (Hedychium flavescens) is somewhat taller, up to 3 m, with off-white to cream flowers in a cone-like inflorescence, with the bracts strongly overlapping. Seed is not produced. Common in northern NI on road-sides, forest margins, stream-sides. This species is subject to a Pest Plant Management Strategy in Taranaki. Listed on the National Pest Plant Accord (see Introduction for details). 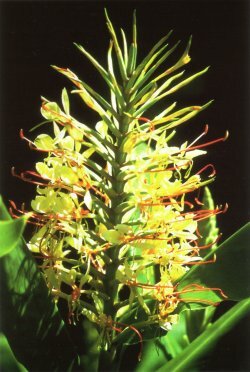 Hedychium (Gr.) = sweet snow, meaning the fragrant white flowers of some species; gardnerianum after Edward Gardner, political resident in Nepal. 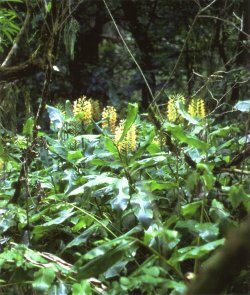 NZ Landcare Trust have a web page featuring Hedychium spp.